The Cleveland Cavaliers surprised observers for the second year in a row in the fourth slot of the draft and then followed up with a trade up to land a big man that the team badly needed and fell farther than expected. Syracuse guard Dion Waiters had supposedly been charging up the Cleveland charts,but most thought that the fourth pick was a bit high and the Cavaliers interest in Waiters might be a smokescreen or at least a trade down possibility. Chris Grant and the rest of the Cavalier braintrust thought differently and tabbed Waiters anyway. Cleveland surprised the league last season with Tristan Thompson over Jonas Valanciunas and that worked with a promising rookie year by Thompson,although the long term decision is still out on the pick. Waiters is regarded as a scorer that can put the ball on the floor,but can hit a jumper,which puts him ahead of many Cavaliers already. Waiters is also rated as an above average defender and his coach Jim Boeheim says that Waiters is the most NBA ready guard that he has ever coached. I disregard the worry of why Waiters never started at Syracuse,that is a coaches choice. Waiters was among the leaders in minutes per game,so I am not concerned about that at all. The scoring is not the worry or even the talent,I believe that is there,the bigger question is this-Do the Cavaliers know what they are getting? Waiters did not make himself available for teams to work out or visit with him as he was reported to have a "promise" to be a lottery pick by one team if he did not do the workout circuit. I am open minded on Waiters as I think the skills are there to make the Cleveland backcourt one of the better ones in the league,but I do think that there is risk here and Cleveland might have made a huge step back,if Waiters does not pan out. But I do have hope-there are few pundits that I respect more than ESPN"S John Hollinger (not Don Hollinger from THAT Girl) and Hollinger's draft rater that uses statistical data project Waiters as "the best small wing prospect since Dwyane Wade". If that comes true,look out league! I do like the move up to get the 17th pick from Dallas,who had selected North Carolina center Tyler Zeller there. Cleveland sent their other three picks 24,32,and 33 to Dallas for the Wladimir Klitschko look alike and I think that when you can gain a lottery level talent for those picks,you made a good deal. The seven foot Zeller runs the floor well and hits the boards strongly and was no worse than the second best available center in the draft. Zeller will never be a huge scorer,but I do think he will be a useful player for a long time. A superstar? No,but a 12 and 8/10 type player and those guys are always a part of good teams and considering the cost of the trade,I am totally on board with this one. Wishin and hopin for the Cavaliers! 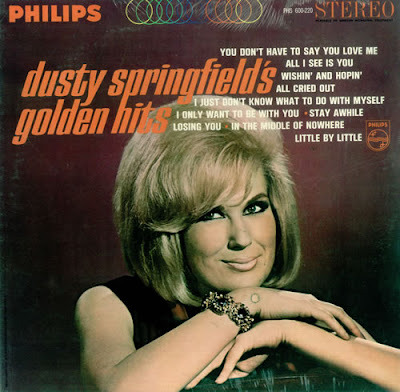 Let's start with this and No,I won't be singing any Dusty Springfield songs! I do not watch as much college basketball as I used to,so my knowledge of the draft is far more limited than it was ten years ago. However,I did watch a lot of the conference and NCAA games,so I have seen the players that Cleveland could be taking. With the fourth pick,Cleveland has to get one of two players-an outside shooter or someone that can play on the wing. Assuming the Cavaliers stay at four and they have been rumored to move up and down,one of these three players are the likely pick. Bradley Beal fits the outside shooter part as he rates as the best shooter in the draft. The Florida Gator is easily the best off guard in the draft and could be the fit the Cavaliers are looking for with Kyrie Irving. The question with Beal is this -Is he more Eric Gordon or Ben Gordon? Eric Gordon would be the ceiling for Beal-a shooter that can penetrate and play with or without the ball. Ben Gordon would be a point scorer,but a flawed player that looks better on the scoresheet than in the game..
Harrison Barnes of North Carolina would have likely been Cleveland's pick last year at four,when they took Tristan Thompson,had Barnes entered the draft. A super athletic forward,Barnes looks amazing when paired with a top level point guard,which he would have in Cleveland. My concern with Barnes is that he seems to struggle in creating his own shot and that is mandatory in the NBA. Barnes has tremendous upside,but he might be Marvin Williams on the flip side. Kentucky's Michael Kidd-Gilchrest has the background for meshing with Kyrie Irving as he has played on the same team as Irving in high school. Other possibilities are solid power forward Thomas Robinson of Kansas and the draft's biggest X factor in Andre Drummond of Connecticut,a center of questionable motivation. I wager it will be one of the first three,if Cleveland trades up or stays put. Cleveland has the Lakers first rounder at the 24th slot and I just don't feel comfortable talking names when it could be one of about thirty players and the Cavaliers have two early second rounders. I will say this though-If the Cavaliers do not wind up with Bradley Beal,I think this is a spot for the best shooter available unless a big man falls deeper than expected. In the second round,I look for the best big man available and with one of the two picks,I bet Cleveland takes a European players rights. I just do not see them carrying two second year men (maybe three if Donald Sloan sticks around) and four rookies. A few words on my recent night in Harrisburg in an attempt to see/graph Gerrit Cole,the first pick in last years draft. We left a bit early with a rare cameo appearance from Ryan,who graciously allowed two young graphers to accompany us on the evening. Brandon and Terry were both very helpful on the evening and were a pleasure to have along for the ride. I usually hit Harrisburg with my partner in crime,Bill Cover,but the aforementioned Mr.Cover is in Tennessee,so I was doing my own driving for the second time in two weeks (Bowie with the family and the Battler for Bret Hart). Harrisburg is a very easy drive and it was not a problem finding the park at all,as Bill gave me the name of the exit and everything was familiar from my trips there with him. Harrisburg has become a postgame town for graphing as the autograph alley is often taken for parties as it was on this day,but I still was able to get a few cards signed in the pre-game downtime. The main pickups being Evan Chambers on a few cards and Robbie Grossman on a Florida State League prospect card. While I worked on a few players for Altoona,Brandon and Terry worked on the home Senators and helped me out with a chunk of my purchased Harrisburg team set as well. Gerrit Cole was the starter on this night,so we would get to see him pitch,but would have to wait until after the game for him to sign. So of course,Cole gets line drived TWICE in the first inning,leaves the game after finishing the inning,goes to the hospital and as a result-I miss him. Cole is a big deal to me as I try to get every Pirate first rounder on a ball and I have been able to do that dating back to Andrew McCutchen. So,the ten bucks that I paid for an Eastern League ball was out the door for this night and the ball itself? Well,it is racing to Binghamton New York,where the Curve is headed after this series and hopefully the ball will get there first! The game was LONG,but the company was great with Brad Adams being with us throughout and my favorite political operative Dan Hartman arriving late in the game. After the game,I was able to pick off a few more members of the Curve,but I really did not have many cards as the Altoona team set is not released yet and Cole was unavailable. I left around 11;20 and there were still Harrisburg players that had not left yet,but I was tired and had to drive home. Thanks to Ryan for coming along and spending some time with his old father and to Brandon and Terry for their help on the evening. It was a pleasure having both of you along. Jeff Karstens made his return from injury in Philadelphia and was promptly dismissed with seven runs in five innings as the Philadelphia Phillies cruised to a win over the Pittsburgh Pirates by an 8-3 count. Karstens was the loser and fell to 0-2 on the season. Jose Tabata homered for the Pirates (3) in the loss. The series continues tonight with Erik Bedard for the Pirates facing off against the Phillies Vance Worley. 1) Jose Tabata has one of the better throwing arms in the game,in my opinion,but he seems to get more "in between" hops on his throws than the average outfielder. I have no statistical proof of this,but it sure seems that way and it happened last night twice as Tabata throwing errors resulted in Phillie runs. 2) Jeff Karstens looked to have nothing for this evening. I realize that Karstens was making his first start in the show after an extended layoff,but I have a sinking feeling that the Karstens that we will see this season will be the guy that pitched before 2011 and not the person that threw well in 2011..
3) Doug Slaten tossed one of the oddest innings that I have seen in a while in mop up work from the bullpen. Slaten allowed a leadoff single and walked the next three Phillies to allow a run to trot home. Slaten then whiffed the next three batters to end the inning. As Elvis Presley once mumbled in the cinematic classic "Change of Habit"- "Weirdos,Man Weirdos". 4) The Pirates continue to shuffle on the roster as the newest member will be former Ray Drew Sutton in another attempt to catch a bat in the bottle. 5) I felt pretty bad for Michael McKenry,who smashed a ball that would have been a rare homer to left field and watched as the wind shoved the ball into the field of play and spun Juan Pierre into the ground as he caught the ball. Seems like many times in these situations,it hits the light hitting guys the most. Catching up and snappin' some claws! Been a bit lazy lately on here as I have been having some issues getting online at work. Finally,Interleague play is over and I can enjoy baseball again. Finally starting to kick things in a bit for the upcoming fantasy football season. Believe or not,I grabbed titles in both leagues that I played in,including another IFL title,which is the flagship for all the fantasy leagues that we (Ryan,Corey and I) run. Beginning to get revved up for that special week in August,which will this year feature the New York/Penn league All-Star game,Browns training camp,the IFL Draft and my annual cookout,which is always a great time! I must admit that I was not picking Josesito Lopez to beat Victor Ortiz,but as I watched the tape on Sunday morning with the lovely Cherie,I did see the possible result after a few rounds and told of the possibility. Ortiz has a history of bowing out when the going gets tough and he did so yet again in his corner against Lopez at the end of round nine with a broken jaw. I don't buy PPV fights,but I might make an exception for the true Middleweight champ Sergio Martinez as he attempts to get his WBC belt back after being unfairly stripped from him to almost hand to Julio Cesar Chavez Jr. I always pulled for Chavez Sr,but rooting for Martinez on the 15th of September. Looking forward to Thursday's NBA draft with the Cavaliers holding the fourth and twenty fourth picks in the first round. Two rumors that I have heard have Cleveland moving up ( trading the two picks to Charlotte for the second pick) and down (shipping the fourth to Portland for the sixth and eleventh). Of the two,if both are legitimate offers,I prefer Cleveland taking the latter deal,which would give the Cavaliers 6,11 and 24 plus two second rounders that might be able to swing more deals. 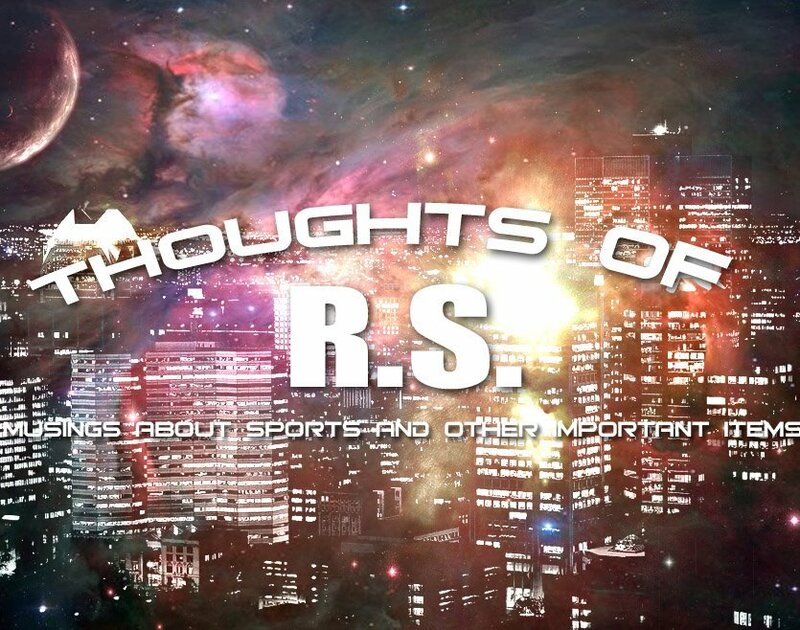 I have opinions on LeBron James,but they will wait for a later post!!! The New Jersey Devils selected a name that haunted Devils fans for years in the first round of the NHL Draft as the team picked left winger Stefan Matteau from the U.S. Developmental team. Matteau is the son of former Rangers winger Stephane Matteau,who ended the Devils season in 1994 with the overtime goal in game seven of the Eastern Conference finals. The 6'1 winger will be playing in the Quebec Junior League this season for a team that features his father as an assistant. 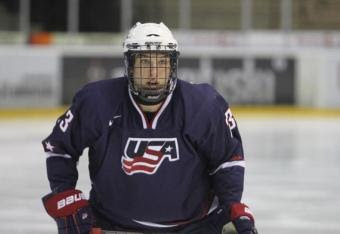 The Hockey News ranked Matteau as the 30th player in the draft and scouts had this to say about the winger-"He has all the tools to be a "power forward"and as a "energetic and edgy" player. I don't claim to be an expert of the non-pro prospect scene,so I have little to go on,but the description makes me think of a bigger David Clarkson type. I skipped the Pirates last night to watch the draft with Rachel,but I did see the blasting of the Twins on Thursday night. 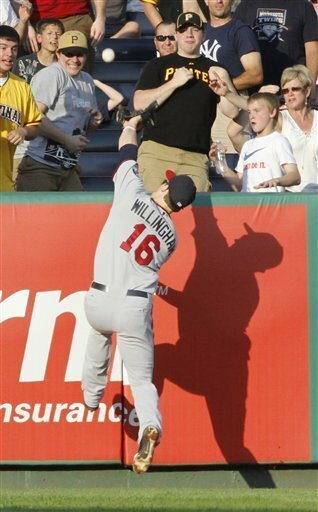 Josh Willingham drilled a Jason Grilli offering over the wall for a tie breaking homer to give the Minnesota Twins a 2-1 win over the Pittsburgh Pirates in Pittsburgh. The Pirates had just tied the game in the previous inning on a Rod Barajas sac fly that almost broke the game wide open had Denard Span not made a spectacular catch. Grilli dropped to 1-2 on the season. 1) Nice outing by Erik Bedard,who has struggled in the month of June. Bedard allowed a first inning run,but no further damage in his best start of the month. 2) Josh Willingham's homer might have been the winning number of the scoreboard,but the Denard Span catch of Rod Barajas' flyball was the real difference. 3) The game was not loaded with notes,so we will go to the minors with the big news being Gerrit Cole's first AA start in Altoona. 4) The rumors are flying that the Pirates will be leaving State College as the home of their New York-Penn league team,but the latest has them moving the team to Morgantown WV. 5) Outfield prospect Wes Freeman retired from low A Wesr Virginia. Freeman looked to have turned his career around last season at State College and skipped straight to High A this season,but was recently demoted to the SAL after amassing a huge number of strikeouts in Bradenton. I may not like interleague play,but the Pittsburgh Pirates are coming around on the topic as the Bucolics won their third game in a row in a 7-2 win over the Minnesota Twins at PNC Park. Josh Harrison's fly ball deflected off Josh Willingham and over the wall (2) in the first inning for a lead that would never be surrendered. Andrew McCutchen also homered (12) in the seventh inning for insurance runs in the victory. Kevin Correia moved to 3-6 with the win with five and a third scoreless innings. The series continues tonight with a battle of lefties with Eric Bedard for Pittsburgh against the Twins Francisco Liriano..
1) The Josh Harrison homer was a lucky break,but these things happen.It looked to me that Josh Willingham mistimed his jump and the ball lightly bounced off him and over. 2) It was nice to see Kevin Correia pitch well and allow just four hits over his evening. 3) Clint Barmes continued his run with the stick as the shortstop whacked out three hits,including an RBI double. 4) The Pirates are now four games over .500 (35-31) and reside in second place,two and a half games behind the Reds. A tentative maybe,when you consider the division that Pittsburgh is in,I would not rule it out,but I still think a bat is a must have to make a serious run at the title. 5) The Pirates are looking at two decisions soon. The first is keeping Brad Lincoln in the rotation for his next start. Lincoln has been ripped in recent outing and might be replaced by the returning Jeff Karstens,who pitched well in a long rehab start at AA Altoona last night. The Post-Gazette offers veteran Rick Vandenhurk from AAA Indianapolis as another possibility. 6) Another decision is on the status of Jordy Mercer,who was added from Indianapolis,yet with the warming of the bat of Clint Barmes,has not batted in ten days. I hate seeing young players sit the bench,when they could play at the lower levels. Hitting the Hitman in Bowie! With the Pirates off yesterday,I have a little bit of time to write about taking the family and Battlin' Bob to Bowie for the appearance of wrestling legend Bret "The Hitman" Hart. Considering that I am not a huge fan of driving on the Beltway,I usually do not hit the BaySox very often. I really do not have the need when you consider that they play in the AA Eastern League with Altoona and Harrisburg,which are of similar distances,yet easier drives. I usually check wrestlers appearances of the local teams over the winter to see who the lovely Cherie and Rachel would be interested in meeting,especially after their excitement over Jerry "the king" Lawler's visit to Frederick last season. They were very disappointed in this year's Frederick grappler selection of "Hacksaw" Jim Duggan to the point of no interest. So,when I read of Bowie getting Bret Hart,I figured that they would go crazy and sure enough,they did just that! The lovely one is not always wild about away trips in the car,but I figured for this one,she would manage to tough it out and she did so splendidly. The trip down was longer,mainly because even though I had been to Bowie twice before,I had never driven there. The Battler' kindly offered his GPS app on his phone,using something called "Waze". Well,Waze had us 20+ miles past Bowie,into a residential neighborhood that we could literally touch the Chesapeake Bay from! Seriously,you hear these storied about GPS' taking you into the water and after this,I not only take their word for it-I have seen it for myself! I asked a nearby jogger for help and she helpfully told us how far we were "Awaze" from the field,pointed us in the right direction and Bob used Google navigator thereafter. A little extra gas and a little extra time,but we cruised right in after that. We got into the parking lot a bit early and was able to hook up with quite a few of my friends from the area such as Tom O'Brien,who is such a huge help in Bowie for me,Mark Bailey,my Devils connection,Mike Belous and of course-the noted "Superfan",who traded about fifty cards with me in the parking lot. 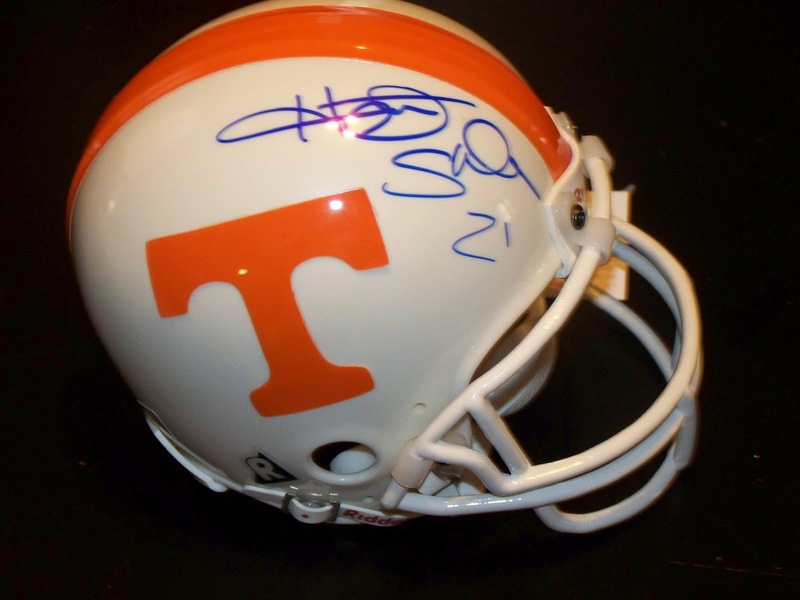 Thanks also to Tom for his help in getting a Tennessee mini-helmet signed by former UT star Heath Shuler! After waiting in line to get in,(at Bowie season ticket holder can get in an hour early) we were reasonably close to the front of the line for Bret. It took maybe a half hour or less to work our way to the front with Cherie and Rachel going first. They were both so excited to meet Bret and I was so happy for them and to have a small part in their happiness. 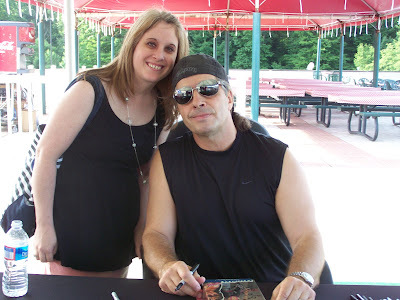 Cherie was able to get a Hitman figure signed (See on the table in front of Bret),while Rachel had her artwork (She is a brilliant artist) of Bret and Jerry Lawler signed. 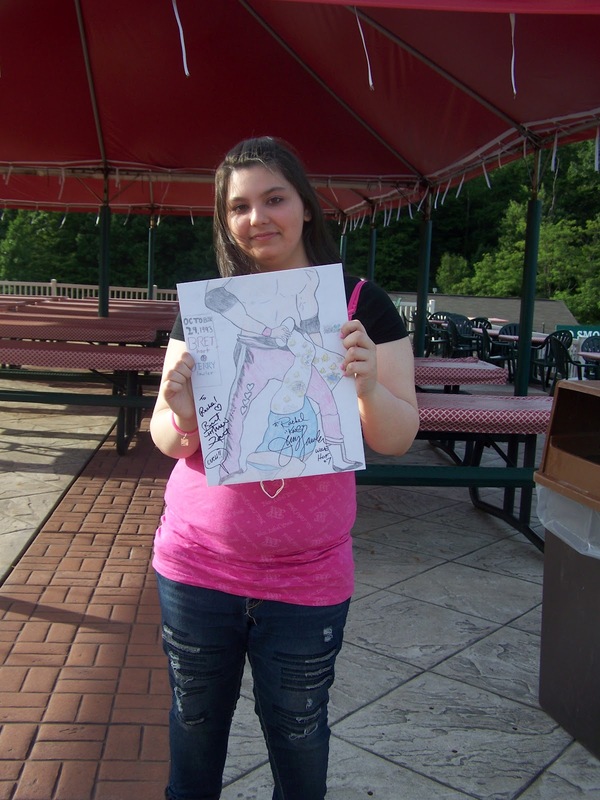 I am sure that she never dreamed that when she did that drawing that both men would sign that picture in person! Bret asked Rachel if she drew the picture and if that was actually Lawler's signature at the bottom. 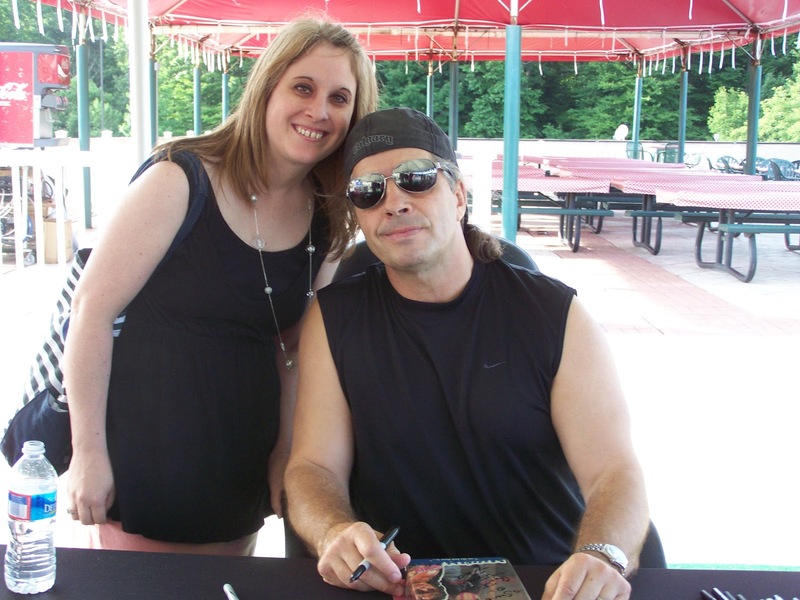 I exchanged small talk quickly with Bret,had him sign a picture and snapped the above pic of me with the Hitman. Battlin' Bob did the same and then a family behind us had nothing for him to sign. I had brought two baseballs,so I offered them a deal-get each ball signed,they keep one and I get one. Worked out well for both of us as Bowie kept the interaction quick-1 item and 1 picture,which is a good thing as it kept the line moving and allowed more fans to meet Bret,who did a three city in three night tour with Richmond Va. being the night before and Wilmington Delaware the night after Bowie. I was able to have a few minutes to work on the Portland Sea Dogs. I did not get a ton in those few minutes,but did get Bryce Brentz,who is hitting very well at AA and Kolbrin Vitek,who was injured but signed anyway. 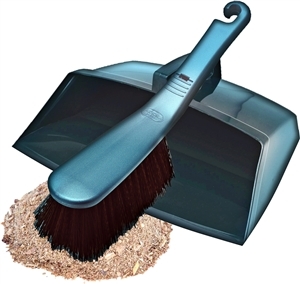 Time to clean the inbox without the usual picture. Not sure what the problem is but Facebook thinks the picture is a spam magnet. 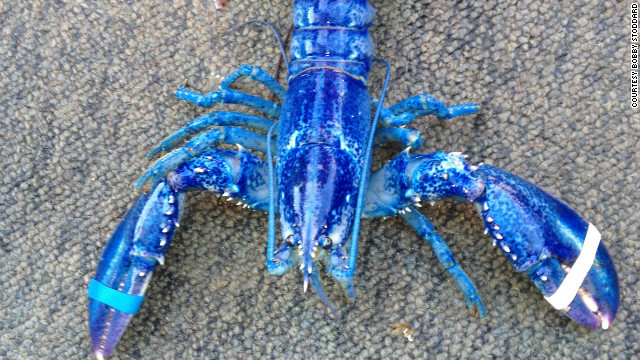 Battlin" Bob sends this item on a Canadian fisherman catching this brilliant blue lobster. 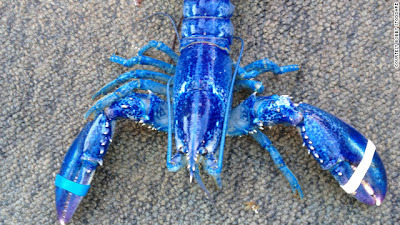 According to the Maine lobster institute-the blue coloring is due to an "excessive amount of a particular protein" and happens once in every two million crustaceans. Want to read through the lines on GOP Presidential candidate Mitt Romney and his work at job cutting at Bain Capital? Take a look at Bain's work after buying toy store KB Toys in which Bain bought the company,leveraged its debt,collected the money and then closed the chain. Wikipedoa notes -"KB Toys was purchased and taken private in 2000 by the leveraged buyout firm of Bain Capital for $305 million, Bain announced the purchase on Dec. 8, 2000. Only $18 million of the purchase money was cash, the rest was borrowed against the assets of the company. Sixteen months after the buyout, Bain Capital paid itself $85 million in dividends (a 372% return on their investment) in 2002. Two years later, due to increasing competition from national discount chains such as Wal-Mart and Target and its enormous debt, on January 14, 2004, K·B Toys filed for Chapter 11 bankruptcy protection and closed 365 stores." KB was the only toy store locally before Toys R US came to Hagerstown and was a regular stop for kids in the Valley Mall,but the chain was struggling with its mall locations that in fairness were having problems with the small size of its stores and therefore lack of inventory. Now that the Pirates-Indians series is finished,which I habitually refuse to watch (I equate it to picking which child you prefer),I can get back to the Pirates. I realize that coverage has decreased this season due to the Devils long playoff run,but now I'll kick things in a bit. The Pirates lost Charlie Morton for the season and maybe next year as well with the dreaded Tommy John surgery. The righthander was 2-6 this season with an ERA in the high fours and claimed to have pitched through elbow pain for a month. In a surprise to me,the New Jersey Devils have decided to keep their first round pick and not pay the "Kovalchuk" penalty this season. I do not claim to be a draft guru,but the crop next year is projected to be weaker than this years class and Lou Lamoriello may look at things that the 29th pick this year may be better than say the 20th next season.. The Devils did add a player in 23 year old Finnish winger Harri Pesonen,who was part of the star line for the champions of Finland's top league. According to In Lou We Trust,Pesonen led the league champions in scoring and signed a two way deal with New Jersey. Now that my online issues seem to have been solved,I'll attempt to get things back to normal. Thanks to everyone for the best Fathers Day that I can remember! Thanks especially to my family and to random luck for meeting an old friend. I hit the Maugansville Card Show to look for some of the new Topps Debut to get signed (Look for an On the Signing Front soon) and of course to add a few to the 1971 set. After dumping 14 bucks on debuts,I decided to add just two high numbers to the set and purchased Pete Ward of the Yankees and Jim Qualls of the Reds. 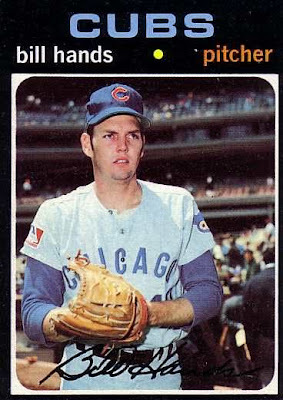 Qualls has one claim to fame,which is a ninth inning single as a Cub that broke up a Tom Seaver perfect game. So I took the lovely Cherie to the grocery store to pick up some shrimp. She and Rachel offered to take me out for dinner,but I offered an alternative to that,so I could spend the day at home watching the U.S Open and avoid people! As we finished paying,she realized that she had forgotten to buy a lemon,so I told her that I'd make her a deal-I'd wait for her to go through the line for the lemon,if she would wait for a minute for me to return to the show and buy two more 71's that I had wish I had bought-Ike Brown of the the Tigers and Bill Hands of the Cubs. Fair enough,so as she came out,I told her that I had changed my mind,I'd just get them next month. First,I left the parking lot going a different way than usual. That put me in a situation of having to go towards Maugansville or having to go out of the way to turn around. So I went that way and got into the turn lane to travel onto I-81,then I remembered-there is no show next month as the Maugansville show skips every July. I swerved into the straight lane and figured I'd grab them quickly. As I waited to pay for Hands,this voice said "oh,my god",It was a long lost friend Brad Berger and what a welcome sight he was. I spent about 20 minutes or so catching up and I am so glad that I did! Sometimes,things happen for a reason. I suppose that this was one of those,. I was able to spend time with my family here and Ryan came over for a pair of hours,so I was able to see him as well. Thanks to all three of the most important people in my life for the gifts and terrific day and I appreciate that they care enough about me to do so much..
Back with some inbox stuff and some opinions on things as well!!! I am able to be online for a bit until Verizon arrives and will hopefully get things cleaned up and back to normal sometime today. Time to say a few goodbyes that have filled up since the last cleaning of the inbox. We start with a gentleman that honestly I figured had already passed in Frank Cady. Cady played the role of "Sam Drucker" on Green Acres and Petticoat Junction as the owner of the only general store in "Hooterville". Cady must have been one of those rare people that got quickly to looking like a certain age and then leveled off and never changed thereafter,I suppose. Another TV icon of the that era was lost as Richard Dawson at the age of 79 passed on from Esophageal cancer. Dawson was known for his supporting role on Hogan's Heroes,his being the go-to regular on the game show classic in the Match Game and his hosting of the original Family Feud in which his claim to fame was the kissing of all the female contestants on the mouth (the better looking ones usually got quite a kiss). Dawson changed the face of the Match Game because in the money round,contestants always chose Dawson as he was so skilled at the game. As a result,the game began to spin a wheel to match up in the money round because Dawson was so adept and no other stars were ever selected when Dawson was available. Henry Hill may not have been a good man,but his story did make a terrific movie in Goodfellas. Hill,a mobster that informed on the Mafia, was in and out of witness protection after the court case was over and led a troubled life. When I was a kid,the most feared heavyweight in the world was not Muhammad Ali. It was not even the feared punchers of the day-Joe Frazier or George Foreman. It was the three time Olympic heavyweight gold medalist Teofilo Stevenson of Cuba,who never threw a professional punch. Stevenson won golds in Munich (1972),Montreal (1976) and Moscow (1980) and deflated American heavyweight hopes along the way. Stevenson destroyed the American's future white hope in Duane Bobick to the point that Bobick was unable to take a good shot as a pro. After dispatching Bobick in Munich,Stevenson would stop future WBA heavyweight champion John Tate in Montreal and would defeat future champions Michael Dokes and Greg Page in non-Olympic bouts as well as 1984 gold medalist Tyrell Biggs. Stevenson was undefeated in his bouts from 1972-82 and might have won two more Olympic golds as Cuba boycotted the 1984 (Los Angeles) and the 1988 (Seoul) games before Stevenson retired in the fall of 1988. Time to say goodbyes to two pitchers from my past. Dave Boswell passed away at the age of 67. Boswell won 20 games for the 1969 AL West Champion Twins and would only win five games after that season. Boswell also is remembered for missing starts in his 20 win season for being beaten up by his own manager in a bar as the notoriously pugnacious Billy Martin did the honors. Pedro Borbon was a reliever that was used in several roles out of the Cincinnati Reds bullpen in the 1970's. Sparky Anderson used Borbon as both a long and short reliever and with Anderson's reputation as "Captain Hook" and frequent use of the bullpen,Borbon put tons of miles on his arm. From 1972-1979,Borbon never appeared in less than 60 games for the Reds and was known as quite a character off the field as well. I hope to be back later tonight from the road office with more! Having server problems that I hope to correct tomorrow with Verizon. I have plenty to write about,so stay tuned and if I can tough it out tonight,I'll have a post up!!! 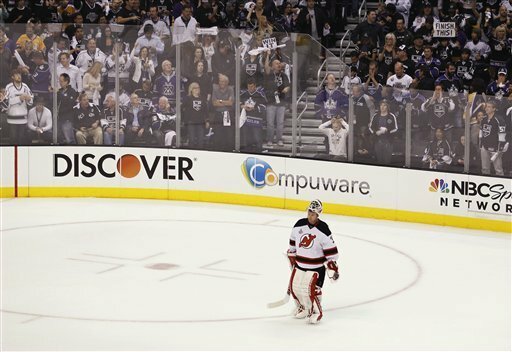 A terrific and unexpected season ended in Los Angeles as the New Jersey Devils were hurt by a non-call and a dumb decision,which allowed the Kings a five minute major and that resulted in a 6-1 series ending loss. Adam Henrique scored the only Devils goal with the score 4-0 Kings,while Los Angeles would score two empty netters to inflate the win. Today's Hell Raisers may be entered with a few grapes with my whine,but I think they are deserved. Most of these will be looking towards the future as we clean up the past. 1) Lets get right to it-the referees put the Kings in the position to win. They did not win it,cheat or put three pucks into the net.but the non-call on Jarrett Stoll on Stephen Gionta for boarding was the set up for the call that changed the game (HR 2). If that call is made,Rob Scudari never takes the hit because the next time the Kings touch the puck-it would be blown dead. 2) If the puck was blown dead,Steve Bernier is not looking for revenge for the hit on Gionta and he will not launch such a reckless and dumb hit. I understand Bernier's reason and his frustration,but it was a very bad hit and a very dumb play-Bernier put the referees in a position to decide the game. 3) I also think the referee that "picked" Anton Volchenkov and then led to the fourth goal should be forced to take a class in getting out of the way of the play. 4) All of that written-the Kings would have likely won anyway. The Devils did not seem flat as much as worn out. If there would a case to prove the case that fewer games trump higher pressure games over the playoff season,this one would be it. 5) Now,its time to thank an underdog team. The Devils were not even picked to make the playoffs by many member of the hockey media and yet made the Stanley Cup finals. When you consider that and add the fact that the Devils smashed the dreams of their two biggest rivals,I consider this a successful season. 6) The Devils now have to deal with the off season and will need to do quickly. I look for the Devils to take the hit for the Ilya Kovalchuk signing this year by turning in their first rounder. This is the best year to do it as the pick will be the next to last pick in the round. 7) New Jersey has 11 unrestricted free agents and some of these players will be gone. The two that will swing the franchise's future will be Zach Parise and Martin Brodeur. Brodeur's decision will be about whether or not to retire and affect the team as far who replaces him in goal. Marty has said that he will decide by July 1st on his decision,so that the Devils can have time to figure out what they want to do. I think Marty will be back for one more season. 8) Zach Parise is a different matter.The Devils captain is the top available free agent this season and will likely have many suitors. Parise has said that he wanted to see if the Devils could bring him a chance at the cup and they have done that. The big questions are these- does he think that the team can continue this type of contention? Is this about how much money he is paid and if so,can the Devils and their financial issues compete with the teams that will toss bucks his way? 9) Of the rest,decisions will have to be made.Bryce Salvador might have played his way out of New Jersey with his playoffs performance and get a contract that the team is not willing to match. I would bet that Ryan Carter,Stephen Gionta and Steve Bernier will be wanted back,if the price is right. Alexei Ponikarovsky disappeared a bit in the later series,so I would not be sure on them. 10) The teams financial situation has to be mended and quickly before the free agent period starts. I would hate to see the Devils lose Zach Parise because of these off the ice issues and I hope the Devils can line up the investors to help straighten out this mess. Gary Bettman thinks that will happen and as much as I question Bettman's hockey credibility,I give full credit to him on the money side. 11) Finally,one more thank you to the team for a terrific season and for being the team that made Rachel care about the game. I know that Rachel is disappointed,but this will be a first season that she will never forget and my gratitude to the Devils for hooking her as a fan is immense. Thanks again guys for a great year and I will see you in October. Just a note or two and then some recent passings of further note. I didn't see the reported Manny Pacquaio robbery against Timothy Bradley,but it is tough for me to have too much sympathy for the Pac Man,considering that he took two wins and a draw from Juan Manuel Marquez in three fights that I scored for Marquez,albeit three close fights. The Pirates have already signed their second round draft pick in Wyatt Mathisen. No word on a bonus number,but Mathisen was rated as the top high school catcher in the draft and was taken out of a University of Texas commitment. The New Jersey Devils attempt to keep their miracle run alive tonight in Los Angeles. The Devils two wins after being down 3-0 made them the first team since 1945 to force a game six after being down 3-0. Only one team ever has been down 3-0 in the Cup finals and won the series-the 1942 Toronto Maple Leafs. Best wishes to Paul Williams to fight back from a motorcycle accident that has left him partially paralyzed from the waist down. Williams had signed to face WBC Junior Middleweight champion Saul Alvarez in the fall in a pay per view fight a few days before the accident..
Time to note a few recent passings. Multiple world titlist Johnny Tapia was found dead in the state of New Mexico. Tapia was one of the more exciting fighters of his era,but was known for his constant issues outside of the ring that saw him with several court related issues. The five time champion was best known for his series of bouts with Paulie Ayala and Danny Romero. Former Fleetwood Mac member and solo artist Bob Welch committed suicide in Nashville. Welch had been a integral part of the band until 1975 when he left/was forced to leave for a solo career and has been given much of the credit for sending Fleetwood Mac towards the sound that would give them their highest success. Welch had a few hits as a solo act including "Ebony Eyes""Precious Love" and "Sentimental lady". Former Soviet hockey star Vladimir Krutov passed recently at the age of 52.
as the main line for the Soviet Union's hockey powerhouse of the late 70's and 80's. All three signed with NHL teams in the late 80's and while Makarov was the rookie of the year for Calgary and Larionov spent a long career with several teams,Krutov came into the league in bad condition and spent one poor season with Vancouver,before returning to Russia. The New Jersey Devils continued the hopes of the Devils army for a miracle of all miracles as they defeated the Los Angeles Kings 2-1 in game five of the Stanley Cup finals. Zach Parise scored a power play goal in the first period for the early lead and Bryce Salvador's goal in the second period put the Devils goals on the scoreboard to lead them to victory. The Kings still lead the series three games to two,as the teams travel west into game six on Monday night. 1) The Devils continued to change the tempo of the game. They kept the puck in the Kings zone and kept the breakaway chances to a minimum. 2) Martin Brodeur was great. Brodeur has played very well in this series and has shown that he has plenty left in the tank. 4) Jonathan Quick may be many things,but a puck handler is not one of them and his attempt to play the puck ended up with Zach Parise's goal. What was going through Quick's mind??? 5) Not that the Devils offense did a lot on this night. One goal off a King back and another when the goalie hands you the puck while he does not guard the net means that you got some breaks,not that the offense played well. 6) Very nice game by Henrik Tallinder. 7) Is the pressure more on the Kings now? Yes,they have to be thinking that game six is their chance to slam the door at home..
No,because they can afford a loss,the Devils cannot. 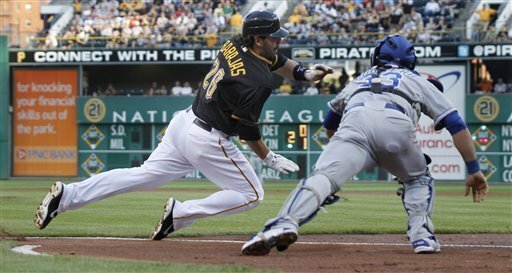 The Pittsburgh Pirates started their uninterrupted portion of interleague play with a 4-2 win over their American League "cousin" (more on that below) Kansas City Royals at PNC Park. Erik Bedard allowed both runs over seven innings of action and improved to 4-6 on the season and Joel Hanrahan finished up in the ninth to earn his 16th save of the season. 1) This game featured two plays that were not the most visually impressive,but scored two runs for the Pirates in a two run win. The first was lumbering Rod Barajas being sent home on a single by Clint Barmes that saw the catcher dive out of the way of the tag of Humberto Quintaro and then crawl/roll back to the plate to touch it for the run. 2) The other took advantage of the non-DH game as the Royals had to use regular DH Billy Butler at first base and move starting first baseman Eric Hosmer to right field to get their bats into the lineup. 3) Neil Walker smacked three more hits as Walker continues a hot week with the bat. 4) I thought Erik Bedard looked sharp in his seven innings. The curve is clearly the key to Bedards's game. 5) Why do I consider the Royals the Pirates cousins? Small market franchises with a proud history that have been awful for years that are spending money in the draft and trying to build through the farm system. I was watching a terrific series on one of the 10,000 regional sports networks called Baseball's Golden Age and a segment was on the lost ballparks of the past . I really enjoyed it,so I have decided to start an occasional series called Ballpark Dustbin. This will feature ballparks and arenas of the past that should not be forgotten and joins Forgotten Superstars as the series that will be added to through the years. We will start with the former home of the Cincinnati Reds in Crosley Field. I am in a Reds frame of mind as the Pirates and Reds are playing and I had to leave for the road office before the Pirates win in ten innings tonight. Crosley Field was the home of the Reds from 1912 to 1970 and was another of the "neighborhood" style ballparks built for the teams in the early part of the 20th century. Back then,when ballparks were built,the parks were squeezed into the existing infrastructure and forced to work around the neighborhood. 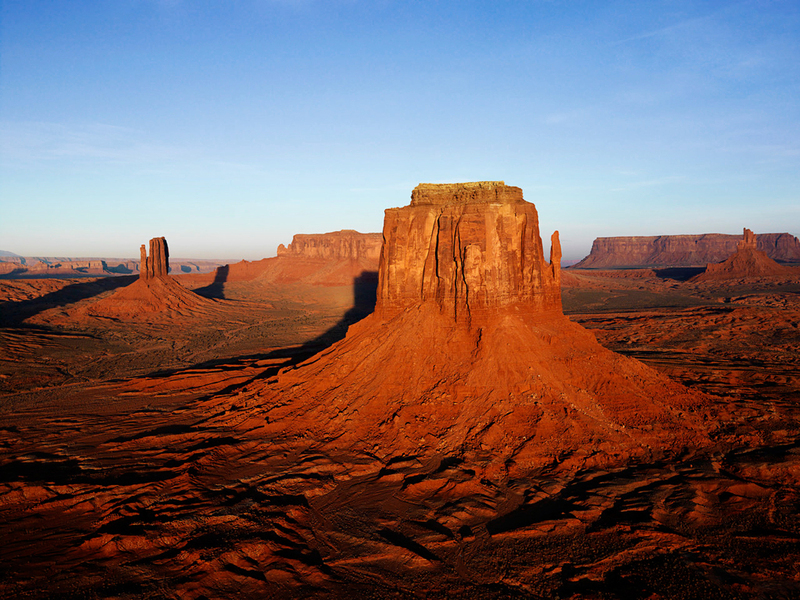 As a result,that is the reason that those parks consistently had the unique dimensions that so many are known for. The current "retro" parks have copied many of the odd and quirky dimensions,but the trend was due to ascetic reasons not by necessity like the originals that are often used for ideas. Crosley Field was one of those,but the righthanded slugger had a large edge there compared to the lefty bomber as the left field fence was 328 feet away,while right field was 366 feet away,which was pretty comparable to center and the power alleys. Crosley was unique for the terrace or steep hill in left field that has been imitated in center field in Houston in the Astros current stadium. The terrace had to be a difficult one to traverse for left fielders because it was more in the field of play than the hill in Houston,which is more decorative as it takes a huge blast over the centerfielders head to reach the hill. 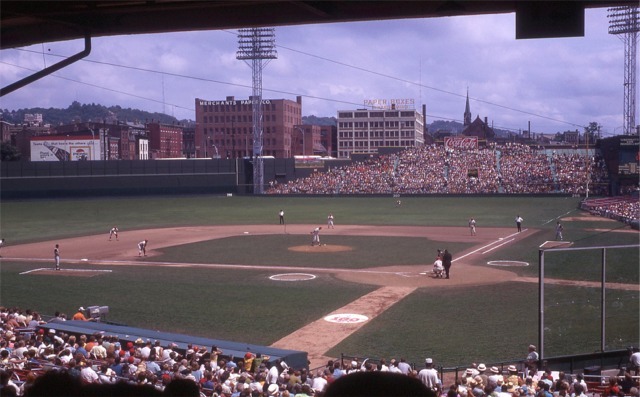 I know from watching left fielders struggle at the Muni with the hill that exists there and their issues and that hill is a bump compared to Crosley,so that had to be a huge advantage for the Reds compared to the visitors playing out there. Crosley Field was one of the smaller parks in baseball as for most of its tenure,it held less than 30,000 seats and was one of the parks to be hardest hit by the change from public transportation to the automotive age as Crosley had few places to park and therefore took a hit in attendance as the out of town fans had major issues in attending Reds games. Crosley Field was also the home of the first night game in the majors in 1935 and the reason that the Reds fought so hard to have the first lights in the league was that they were concerned about the viability of the franchise,which was mentioned again in the late 50's and early 60's,with many people crediting the 1961 National League champions Reds for keeping the team in town as various towns were rumored to be courting the Reds,most notably San Diego through the 1960's. Crosley also had the huge manual scoreboard in left field that was the staple of so many of the older inner cities parks of the time,but Crosley's came a bit later to the party as it was built for the 1957 season. The Crosley scoreboard ranks with the Polo Grounds as my favorite of the scoreboards of the time. Crosley Field was doomed by several factors besides the parking and size of the facility. One was the neighborhood,which many considered blighted and kept fans from attending night games. That kept any expansion/renovation from occurring to Crosley. Between the rumors of a Reds move and the need for a stadium for not only the Reds and for a facility to attract a football team,the city finally approved a stadium off the concrete doughnut template on the condition of having a football tenant,which occurred with the deal to bring the expansion Bengals to town. The Bengals would not play their games at Crosley as Riverfront Stadium was being built,they would play at Nippert Stadium,which is still used by the Cincinnati Bearcats to this day. Crosley Field's last game was in June of 1970 as Riverfront Stadium was finally ready to open.Ironically,had there been a small delay in Riverfront's opening,Crosley would have hosted post season baseball one final time as the Reds won the National League West and then defeated the Pirates to go to the World Series,where they lost to the Orioles in five games. Crosley was then used as a city impound yard for two years until 1972 when Crosley Field met the final wrecking ball..
A short trip to the mailbox,which is usually thin pickings this time of year as the time that is spent on the mail portion of the show is spent on in person stuff,so these are usually people that were a little slower than most..
Former Giants and Cubs outfielder Gary Matthews Sr. The Wilmington Blue Rocks hit Frederick for their first visit and the Blue Rocks had a few prospects,mostly notably Brett Eibner,Cheslor Cuthbert and Brian Fletcher,who in the case of Fletcher I missed,but the star of the show was a player that spent three years at Low A battling injuries. 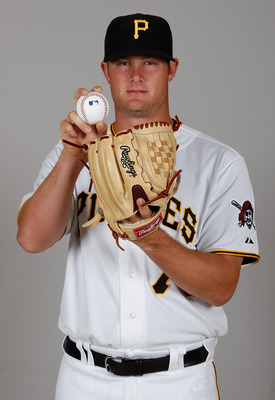 Sam Runion was a pitcher with tons of cards in 2009-10 and finally reached the Carolina League. It seems like most of the graphers present had massive numbers of cards and could not wait to fill spots in their collections. Runion was super nice,signed everything for everyone,which was considerable and chatted a bit. The Dylan Bundy show hit Hagerstown with the Delmarva Shorebirds and seemingly every grapher in the area and some outside of it showed up in the Hub City. Bundy was a solid two per person signer and was nice about it. Bundy figured out how to avoid the graphers on his charting days by leaving the outside door of the clubhouse,walking into the Muni parking lot and coming through the front gate. I was able to get a card signed for my friend Corey in Tennesse (more from him soon) for his collection as I was leaving the Muni to go home and watch the Devils and ran right into Dylan,who graciously signed the card. Bundy was promoted to Frederick after his Hagerstown performance and I saw his Frederick debut in person. I have yet to try to get Dylan in Frederick yet since I have already gotten him on the two cards that I had at the time,although I am sure I will need him in the Delmarva and Frederick team sets along with his likely inclusion in the SAL and maybe Carolina top prospects. The sad news is that he is reported to be down to one per now.. I did not need a ton of the Shorebirds except for the mainstream cards sine Aberdeen had been knocked out last year by the "SuperFan" for me. Nicky Delmonico was super great,signed all for everyone every night as was Mychal Givens,who has always been great when I have seen him in the past. I also talked to Nicky about his dad,the former head coach at Tennessee,who he told me was interviewing at West Virginia for their head coaching position. With WVU going to the Big 12,one of the top baseball conferences,they will need to upgrade their program to compete with the bullies in that conference. I made a road trip with the perpetually people loving Kendall Morris to Altoona to see the Erie SeaWolves. 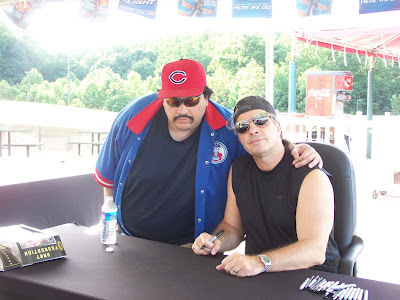 I had next to no cards for Erie,but I went anyway,partially to get what I could signed and partially to keep Kendall company,although mainly because it always is fun to travel with someone that is as much of a people lover as I am! I was able to get the few cards that I had signed,including a few extras that Kendall had given me. Biggest catch was prospect catcher Rob Brantly,who signed one,but the best part was finally having the Ray Burris experience. Keep in mind that Ray Burris has perhaps the worst reputation among signers,mainly because he not only doesn't sign (I'm fine with that,it really is their choice),but lectures you for ten minutes about why he does not sign,which not only does not result in an autograph,but keeps you from getting others because you cannot get away from Burris. Kendall had said that he was going to ask him to sign and Burris walked by. Kendall shouted "RAY!" like the old beer commerical "you can call me ray,jay etc",Burris turned looked and kept walking. 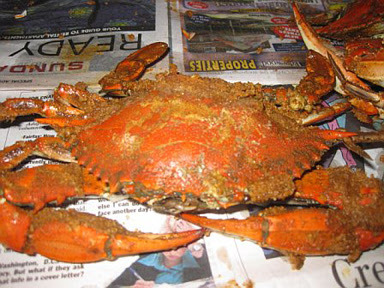 Frederick hosted the new Carolina Mudcats,which were the old Kinston Indians. The biggest catches were shortstop Tony Wolters and catcher Jake Lowery along with pitchers Kyle Blair and Jordan Cooper. This night had a big rainstorm,so the hill at Frederick that leads to the bullpen had tons of slick grass and I was not going to traverse that hill in sandals on wet grass. Thanks to Justin for getting Cooper for me,Justin is far younger and in better shape than I and he went down and got Cooper with his stuff. I could keep seeing this conversation with the lovely Cherie-"I just blew out my ACL,but I got my Jordan Cooper cards signed!" I had next to nothing for the Greensboro Grasshoppers because short season Jamestown did not have a 2011 set released. The big catch for me was the Marlins first rounder Jose Fernandez. I only had one card for Fernandez,who made it clear to all that he was signing two and only two. Josh Hodges was very nice as he signed everything on a day that he was the scheduled starting pitcher. That rarely happens and Hodges was terrific as was Brent Keys. Brent told me he did not have time,but would get me between games (DH). Graphers hear that type of thing all the time and rarely does it come through. As the players left the clubhouse for game two,Brent told the player he was coming out with that he be right with him and came right to me and said "I told you I'd be back". Time to say thanks to my new friend in Tennessee,Corey White for his help with the Southern League. I met Corey on last years trip to Tennessee,we hit it off and we have been working together to try to help each other out. Corey helped me with the prospect laden Jackson Generals (Mariners) and the Tennessee Smokies. Corey has been able to get me two thirds of the Generals stud pitching prospects in Danny Hultzen and Tajuan Walker (I had no cards to send him on the third player James Paxton) along with Rich Poytress,Nick Franklin,Denny Almonte and a card that I thought to be long sent to the dust bin in the 2007 Carolina League top prospect of former Braves farmhand Eric Campbell. It is always cool to get cards that have been around that long finally finished. Among the Smokies were Trey McNutt,Logan Watkins (noted for his blowoff of us in Lake County in 2010) and former Hagerstown Suns Michael Burgess,who Corey reports has improved as a signer since his days in the Washington system. Thanks to Corey for all of his help!!! Next trip was back to Frederick for the first repeat team of the season in the Salem Red Sox.Winston-Salem actually had repeated earlier,but I did not hit the Dash on that trip in. The biggest catches were two players that I had gotten in the past,but were very nice in Jackie Bradley Jr and Brandon Jacobs. I love Bradley's autograph,one of the best around and that comes with zero sarcasm. I did need Matt Barnes,who I had two of my cards and cards for Corey C.who was out of town. Barnes pulled a stunt that I had never seen before as he walked around the stadium and came in through the other side to avoid the graphers. That was a new one in Frederick for me and Barnes went around and then avoided people during and after the game. Bill Cover and I finally tracked him down in the parking lot on the dead run as in I ran and then felt like I was dead! I'm too old to run like that! Kendall Morris filled in a few of the guys I missed (notable being Xander Bogarerts) when he returned the following night for the Red Sox-thanks to Kendall for those. Bill and I traveled to Harrisburg for the Portland SeaDogs and were rewarded with a rainout! The Kannapolis Intimidators hit Hagerstown to start June.Super strong team with top prospect Rangel Ravelo and former first rounder Keenyn Walker banging out card after card for all of us. Second rounder Erik Johnson was another nice catch as was catcher Keven Smith,who was slammed into in a vicious home plate collision with the Suns Matt Skole that sent Smith from the game and onto the disabled list. That led to Kevin Dubler being brought in from AA Birmingham to catch in Smith's spot and I was able to get his card from 2011 signed. Kannapolis also featured former Oriole pitcher Jose Bautista,who I was able to get to sign a few more of his cards from his Orioles days. I have been working on my Hagerstown Suns team set and most of the players have been very accomodating thus far. So far,one was been very elusive,but I'll hang tough and get him! Notable Suns thus far have been Alex Meyer,Matt Skole and Caleb Ramsey as well as former TCU pitching star Matt Purke,who signed both cards that I had for him. I also was able to get former Suns first baseman that was rehabbing in Hagerstown Chris Marrero on his 2011 topps debut card. Whew,this one took a while to type up. 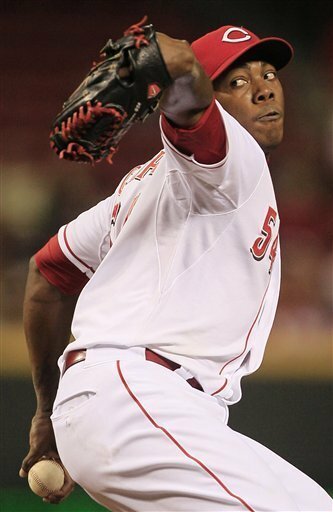 Johnny Cueto dominated the Pittsburgh Pirates for seven plus innings before Pittsburgh sent him scurrying from the game in the eighth with a four run innings to pull within one run before the Aroldis Chapman thunderbolts blew them away in the ninth inning as the Cincinnati Reds held on for a 5-4 win. Andrew McCutchen's tenth homer of the season scored three runs with his blast off Logan Ondrusek to give the Pirates hope of grabbing a huge victory from a huge deficit. Brad Lincoln allowed all five Reds runs in four innings as he lost his first game of the season and fell to 3-1 on the year. The Pirates finish the series in Cincinnati on Thursday. Kevin Correia for Pittsburgh against Mike Leake for the Reds. Nine pitches,eight strikes and three that hit triple digits on the radar gun. I watched the Reds network and they were discussing Chapman's occasional control issues. Did not see any of this on this night. 2) Give full credit to long man Doug Staten for keeping those slim chances alive. Long men are usually put in for sinking ship situations,but are important,if you want to have those miracle chances to win and Doug Staten did that job well in this as he allowed just one hit over three innings. 3) Andrew McCutchen's homer was great,but he was picked off first earlier in the game by Johnny Cueto. 4) Casey McGehee was the starter at third base for the third night in a row in place of the struggling Pedro Alvarez.Alvarez did pinch hit and ripped a single to right. 5) I didn't think that Brad Lincoln's start was as bad as the numbers indicate. The three run double into the gap by Ryan Ludwick off Lincoln was not off a bad pitch,Ludwick drove a good pitch into the right spot. No Crowning on this night! The New Jersey Devils switched tactics and some talent and as a result,the Devils avoided the sweep at the hands of the Los Angeles Kings with a 3-1 win in game four in Los Angeles. The Devils scored three goals in the third period to outscore the Kings one as all scoring was in the final period. Patrik Elias started the scoring,Adam Henrique broke a 1-1- tie with four and a half minutes to go and Ilya Kovalchuk hit the empty netter to salt the game away and send the Stanley Cup back into its case for at least two more nights. 1) Full disclosure-I saw none of the four goals in this game. Honestly,in the time it took for me to leave my car,clock in at work and get the XM boombox set,the game had went from 0-0 to 1-1! 2) So considering all that,I'll try to keep things to what I did see for the most part. The Devils clearly made a change in tactics as the forecheck became less important as the team stayed back a bit,played a tighter more defensive oriented game and the switch paid benefits as the Kings were not as able in transitional play and the Devils were able to get the clear Kings opportunities to a minimum. 3) Peter DeBoer also made a move in the lineup as veterans Petr Sykora and Henrik Tallinder made their series debut.Jacob Josefson and Peter Harrold were scratched in order to play the newcomers to the lineup. 4) Is there any doubt that Adam Henrique is a big game player? Three game winners in these playoffs with two of those coming with the Devils elimination staring them in the face. 5) Martin Brodeur was brilliant in goal other than one mistake that brought back memories of Ilya Brzygalov's muff against the Devils. 6) Finally,considering I missed the final period when things got exciting-a solid game for the Devils. They kept the Kings from playing their game and the Kings will try to adjust to that adjustment in Newark. This series really could be 3-1 Devils with a pair of breaks,but they are not,so you play the hand that you are dealt. This is still going to take a miracle,but the longest journey starts with the first step. Step one taken,step two -Saturday night. The New Jersey Devils knew that they were in trouble traveling to Los Angeles being down two games. Now they are in huge straits as the Devils were smacked 4-0 in game three of the Stanley Cup finals and are now one game away from having their season ended. Obviously,no Devils goals,so nothing to mention there. 1) The first goal was a borderline goal as no one could see the puck,it clearly could have been called frozen and instead the Kings kept whacking away (as they should have) and finally on the third try dribbled the puck past Martin Brodeur. 2) The Devils had their chances including a five on three in the first period. New Jersey had five power plays with one of those being a four minute high sticking penalty that cut Adam Henrique. 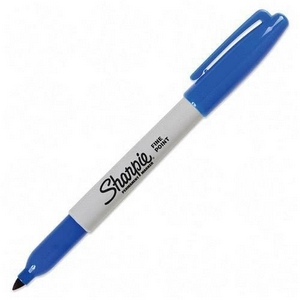 The power plays has been unable to get things going and tonight was a major example of this. 3) The Devils just did not show up offensively. I cannot take one player and say "you know,at least so and so showed up". They did not.I wish that I could say that,but I really cannot. 4) I wish that I had more than I can write. 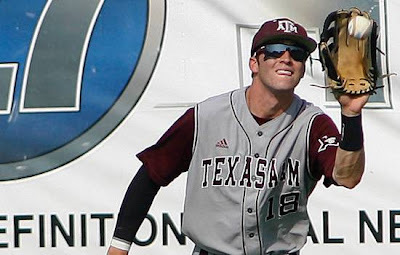 As we applauded the Pittsburgh Pirates for taking the best player on the board and worrying about the signing later,we frown on tonight's selection of outfielder Tyler Naquin of Texas A&M by the Cleveland Indians. Considering the Indians need for a power prospect and to take a player with seven homers in three college seasons makes me think that this was a player picked because he would sign for the slotted bonus. Naquin is reported to have plus speed and hits for average along with having one of the strongest throwing arms in the draft. Naquin hits lefthanded and is thought to have the potential to hit above .300,but to me,Naquin might not have the power to play a corner outfield spot and might not fit as a center fielder. Most previews had Naquin as a first rounder or a "sandwich"compensation pick at worst,but nowhere near the 15th pick. The MLB Network used their comparison for Naquin as David DeJesus. Sorry,but when I own a top 15 pick,I do not want a David DeJesus type player. 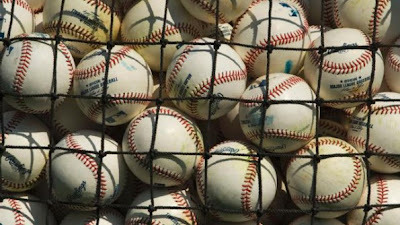 The new rules that have capped the spending for the Major League Baseball draft will have its first test and the team testing it? The Pittsburgh Pirates,who took advantage of the asking price of the player rated by most as the top player in the draft,watched him fall and then tabbed the player with the eighth pick. Stanford pitcher Mark Appel and his agent Scott Boras are going to play the financial game and with the money that the Pirates can offer Appel,it is not a slam dunk that Appel will sign with Pittsburgh. All of that considered,the new rules are "Supposed" to "level" the playing field and allow teams to take the best player without the "signability" concerns. Pittsburgh and Mark Appel will be the first team to see if this truly will be the case. The 6'5 Appel was thought to be the first pick of the draft by the Houston Astros,but the signing issues and the rising of Carlos Correa took Appel down teams board. Appel throws in the mid to high 90's and has a plus slider and changeup. My biggest concern is the abuse issue that comes with so many college pitchers. I was able to grab a few words from Pirates prospect guru Wilbur Miller on the Appel pick and Wilbur is a little more pessimistic than I. "It's a double-edged sword. The Pirates got to pick a guy who was much more highly rated than what they expected with that pick. But they'll have a terrible time signing Appel. He was expecting to go first, where the slot is $7.2M. The Pirates' entire pool is less than that and the 1-8 slot is $2.9M. And they lose the pool amount for any pick they don't sign. At best, they're going to have to overdraft all their remaining picks to save up the money. And then there's Boras, who'll undoubtedly threaten to take Appel to indy ball. I think there's a very good chance they won't sign him, and I don't want them to be the test case for this foolish system. I'm also not totally convinced he's that good, although I only know from what I read. He doesn't seem to have nearly the stuff of Cole or Taillon, and scouts say his fastball lacks movement and his motion is too easy to pick up. Plus, Stanford pitchers have a bad track record. This is an incredibly risky pick." All and all,I like this pick. I know that I have complained about the college pitcher in the past and I stand by that opinion,but that was when the Pirates were picking so high that most options were available to choose from. Mark Appel was clearly the top player available and the Pittsburgh Pirates pulled the trigger on the top player. That said,this will still not be an easy sign. Appel will be slotted for far less than he expected due to his fall,Scott Boras and Neal Huntington have had acrimonious negotiations in the past and the new system will be a hindrance,so Mark Appel actually becoming a Pittsburgh Pirate is not a guarantee. This years MLB Draft comes at a time that I am not as up on the draft as I have been in the past. I allowed my Baseball America subscription to lapse (More of cost and speed receiving the paper than interest),but I have tried to catch up a bit over the last few days. The Pirates are in the 8th slot,the Indians are in the 15th position,while the Giants are seated in the 20th hole. Pittsburgh is a hard team to figure. Their recent successes in the first round have been high schoolers and their college first rounders (Gerrit Cole is too soon to rate either way) have been less than strong. The Pirates are not afraid to take a high school arm,so the best pitcher in the draft of the high schoolers is Lucas Giolito,who has been dealing with an elbow issue,although a recent video shows Giolito healing well. Giolito is a consideration as if he was without health questions,there would be no doubt that Giolito would be off the board. High school lefty Max Fried is a teammate of Giolito and also could be a Pirates pick. The Pirates need bats in their system more than arms,although I usually like to take the best player available. Florida Gator catcher Mike Zunino would be a great choice if he fell to to 8 and might erase the Matt Wieters nightmare,but that would be a tacit admission of the mistake of taking Tony Sanchez a few years back. I really like three high school outfielders in this draft. Byron Buxton will be long gone by the Pirates pick,but I also like Albert Almora,who also might be gone,but I like Courtney Hawkins and he should be available. The word is the Pirates are looking for a shortstop and Carlos Correa of Puerto Rico was thought to be maybe drop to the Pirates,but his stock has rose to the point that he will not likely be available. The Indians love college players and last years pick of Francisco Lindor was the Indians first high schooler in the first round since 2001. The Indians will likely go back to the college pitcher well that they usually plunder and since the Ubaldo Jimenez trade cost them their 2009 and 2010 first round college arms in Alex White and Drew Pomerantz. Duke's Marcus Stroman is short,but might be the most pro ready pitcher available and Oklahoma State's Andrew Heaney looks like the Indians type. Cleveland also has a system that lacks hitters other than Lindor and a few others that have a few questions,so hitter makes sense. The Giants have taken bats in three of the last four drafts in round one and the only arm selected (Zach Wheeler) was traded to the Mets last season,so this pick seems to scream pitcher. With the contract extensions given to Matt Cain and Madison Bumgarner,the Giants can take the best pitcher on their board and not worry about a player being the faster to move through the system. If the elbow has scared teams off Lucas Giolito,the Giants might be in a position to gamble and I also like Lance McCullers Jr as well as Ty Hensley another arm off the Oklahoma high school conveyor belt. 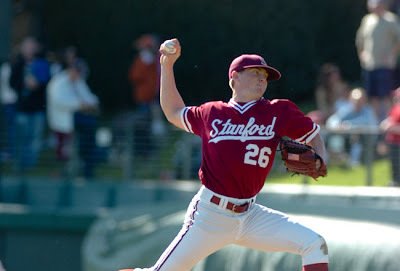 If the Giants prefer a college arm,look at the above arms and add Mississippi State's Chris Stratton to the mix. If the Giants want a bat,I like Stanford's Stephen Piscotty as a local product that the Giants might be interested in. Thanks to Kendall Morris for his help with research and allowing me to catch up a bit. I will be watching the draft for the first hour and then moving to game three of the Devils-Kings. I have now lost both of my grandfathers,I suppose that is expected for someone of my age. One passed in 1996,the other just back in 2010. I was closer to one than the other,but both of them loved baseball. One was just a baseball fan (only boxing had any other interest),the other liked football and basketball as well. One would regale me with tales of the game of the 40's,50's and 60's,the other would stick to the "charms" of my beloved Cleveland Indians. One rooted for the Indians,the other the Orioles,but both were the type of fan that were camped in front of the TV every night that games were televised in the day of mostly road games that were televised and home games meant radio on the big front porch in Ohio or the small screened back porch with a chair and a small couch shoved into it in Maryland. One watched the Wahoos on WUAB-43 from Cleveland,the other the Birds on WMAR 2 out of Baltimore. One would talk about the common team that we shared,the other tolerated my rooting against the Orioles (unless they were playing the Yankees) and never held it against me. One made sure that every year that I visited that a Cleveland Indians pocket schedule was waiting for me to show me that he was thinking of me,the other passed me down battered Red Man chewing tobacco cards from the early 50's,since Pap was always a heavy tobacco chewer. Both were able to pass on a love of the game to a child that already loved it,almost to the detriment of himself. I loved both of those men for the gift that they gave me-the gift of time. Time spent with me watching baseball whether once a year in Ohio or the regular visits to my grandfather just down the road. Not the street,road-streets were for cities or towns,not the road,which ended in Pike in my rural area. I didn't actually play baseball with either,that job was left to this man to improve my game,but I always was able to talk and watch the game with them. I so fondly remember just hanging out with them and watching games,swigging RC Cola with one and my preferred 7UP with the other. One always took me to the A&W root beer stand for coneys and chicken sandwiches to take back and watch the game,while the other always popped popcorn that he grew himself on the stove. Both had distinctive and easy to imitate voices that were voiced in a good natured fashion. Those imitations actually helped keep their voices clearer in my memory from a time that that did not have access to keeping those voices alive on record. As much as I love being able to live in a time that enables my words to be read by anyone that cares in an instant and able to see any game that I want as long as I can afford to pay for it,there was a special feeling to see whatever you could see because things were so limited. Other than ABC's Monday Night Baseball and NBC's Saturday Game of the Week,the only option was the local teams road games and nothing was more looked forward to than the Orioles trips to Texas (pre-1979) and Cleveland (post-79) for the chance to see those teams on TV. It was a big deal in a time that made it tough to be a fan of the team that was far away unless you were a fan of a more national team such as the Yankees. I remember telling my grandfather in Ohio that I was going to call him from the old Cleveland Municipal Stadium when I saw the Indians against the Brewers with a friend in 1982. I did so from a less than clean phone booth at the less than sanitary Cleveland Muni and he never forgot that as it usually got brought up in every visit that I had with him. I am not a grandfather yet and I have my doubts on how important I will be in my future grandchildren's lives,but I do hope that I can pass along my love of the game to someone down the road and create the type of fond memories of me that are similar to what I have of my grandfathers.